This is 100% pure keratin, an ingredient that requires further mixing before use. Sorry, Brazil~! 100% Pure Hydrolyzed Keratin - Keratin that has been hydrolyzed. Pure 100% Keratin. You can add 1-2 ml straight, directly to your dry hair about 10-15 minutes before shampooing and conditioning. 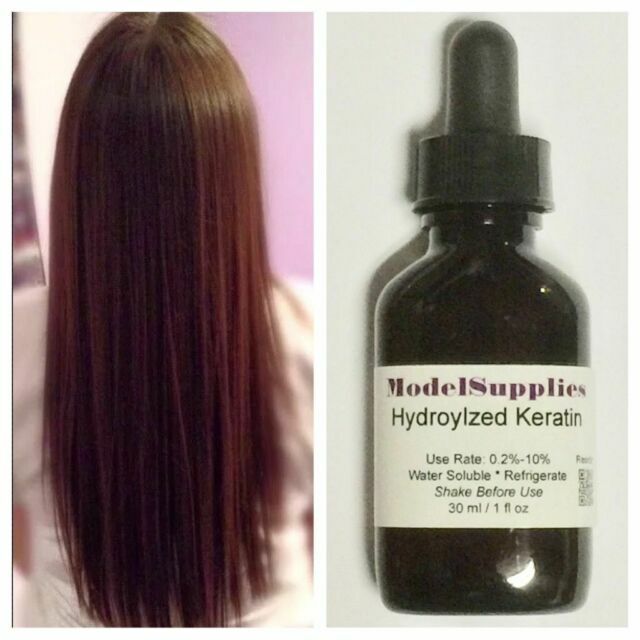 I don't know what I would do without this hydrolyzed keratin. My hair starting falling out because of medication I was taking. I started using this product and it started growing slowly at first, but now it is steady growing. I use this product twice a week and I love it! After years of mistreating my hair, it was badly damaged & frizzy. Became a keratin Brazilian blow out customer. However in the summer I wash my hair daily which quickly washes out keratin Brazilian blow out product. So I turned to this Keratin product and I'm estatic with the results. I add the recommended amount to 1.7 oz of hair silk product and use it as usual. My hair is so silky & healthier than it's been in decades. I absolutely love it!!! This is my second order and certainly a permanent part of my hair care regimen from now on. Thank you so much for this fantastic product. Please note, it's recommended to refrigerate product, which I do. Highly, highly recommend this product!!!!!! I put it in my shampoo and conditioner at 5% since I've bleached my hair couple times. I saw results since the first time I started using it. I think the little bottle will last for a while if you follow the instructions. I totally recommend this product if your hair is damaged. I bought this product a few months ago. I honestly have to say that with daily use it I improved the way my hair looks and feel significantly. I added this product according to directions to my keratin shampoo, conditioner and other hair products I use daily. My hair is super soft and shiny! I will definitely recommend this product and plan to buy more. assuming that this truly is 100% pure, this stuff is AMAZING! i have naturally curly african american hair and i mix a few drops of this in with all my hair products. it really helps with breakage whether my hair is left curly or flat ironed. i think it is pretty pure because i've tried ordering supposedly raw materials before, and they were much more runny than this stuff. this is more of a thick oil and doesnt have a strong chemical odor. will definitely re order when my current bottle runs out!